A new clinical trial at National Jewish Health uses lotion containing beneficial bacteria to fight the harmful bacteria on the skin of eczema patients. Researchers hope it will lead to a long-term solution for those suffering with the painful, itchy skin associated with the disease. (DENVER, Colorado) – Eczema is the most common skin condition worldwide. Without effective treatment options, patients must often suffer a lifetime of painful, itchy skin. 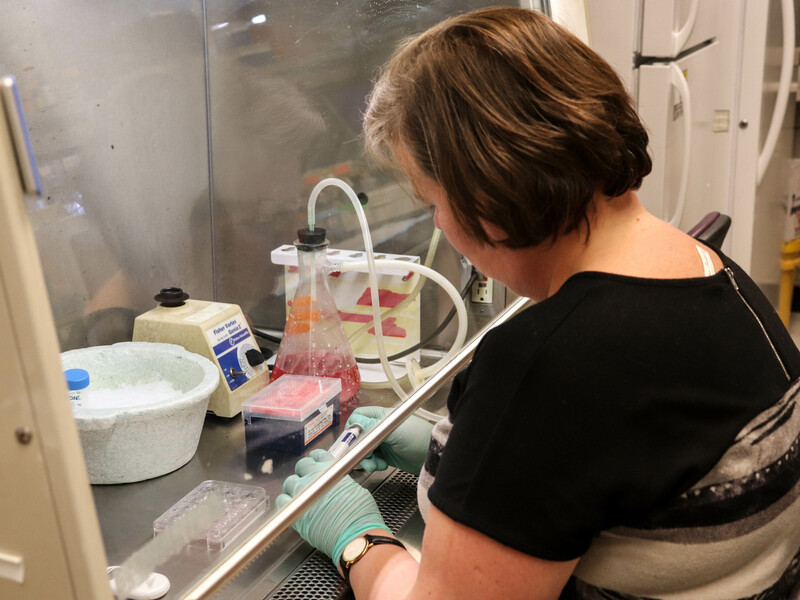 In a new clinical trial, researchers at National Jewish Health are exploring a surprising new approach – fighting bacteria with more bacteria. Leung says more research is needed, but the hope is that this will clear the skin of eczema patients, and ultimately lead to a long-term solution for those who suffer from eczema. Donald Leung, MD, speaks with a patient at National Jewish Health about her eczema symptoms. Dr. Leung is leading a clinical trial that uses lotion containing good bacteria to kill the harmful bacteria on the skin of eczema patients. Cassandra Rodriguez walks with her son in a park near their home in Arvada, Co. She has suffered with eczema her whole life and recently participated in a clinical trial testing a lotion that uses good bacteria to kill harmful bacteria commonly found on the skin of those with eczema. Skin DNA from eczema patients is tested for harmful bacteria in a lab at National Jewish Health. It’s part of a clinical trial for a natural eczema treatment that uses beneficial bacteria to address the biologic cause of the chronic skin disease. 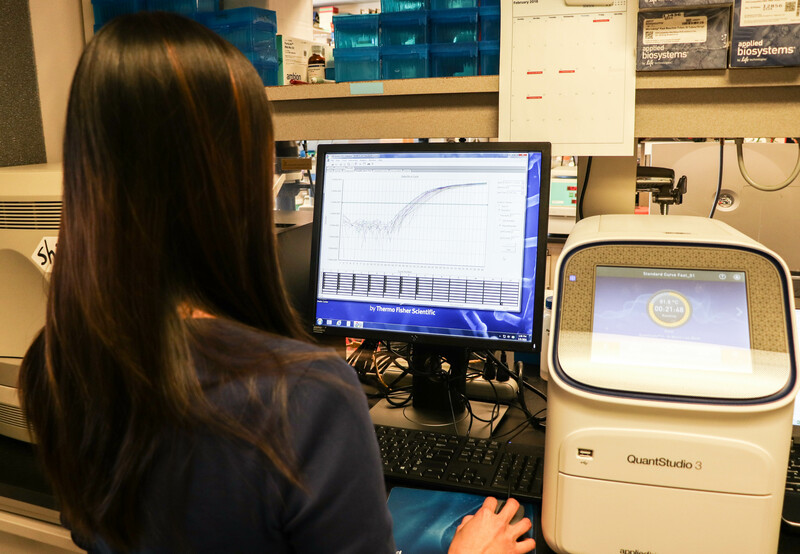 A researcher at National Jewish Health uses technology called PCR to analyze the amount of harmful bacteria on DNA from an eczema patient’s skin. It’s part of a clinical trial to test a new lotion containing beneficial bacteria that kills bad bacteria on the skin. 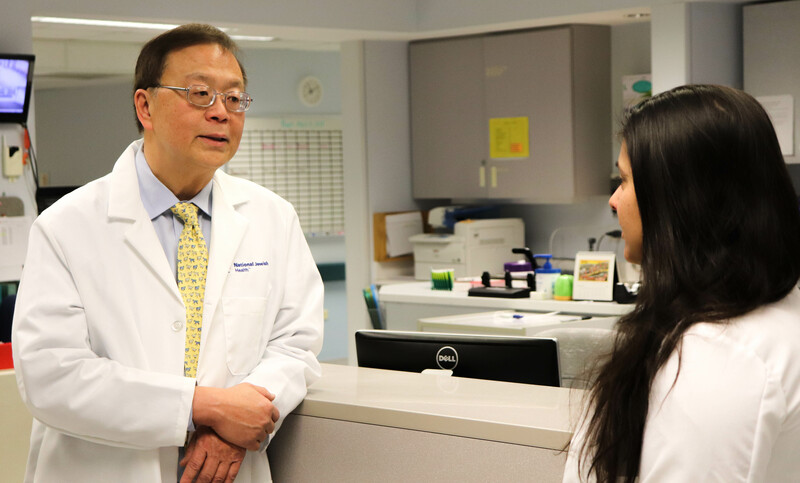 Donald Leung, MD consults with a colleague at National Jewish Health. Dr. Leung is leading a clinical trial to test a skin lotion containing beneficial bacteria that kills harmful bacteria on the skin of eczema patients.